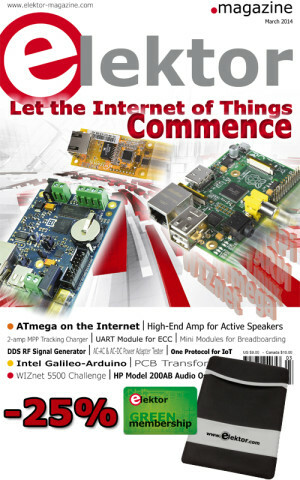 Elektor is the magazine for electronics professionals like yourself. Every single edition is loaded with up-to-date news and views, real-world lab tests and high quality DIY construction projects. You can rely on Elektor for solutions and insights to all your electronics challenges. Raspberry Pi, Arduino, embedded Linux, 3D printing and more. If you’ve been enjoying Elektor.POST every week then now is the time to leap forward to Elektor magazine. For a limited time only you qualify for a massive 25% DISCOUNT on our GREEN Membership! The Elektor GREEN membership is digital only, meaning that you can avoid having to visit your nearest retailer every time you want a copy of Elektor Magazine. Furthermore, you’ll receive every issue digitally, making for an easily storable, environmentally-conscious collection. If you take out a GREEN Membership before March 1, 2014 you can enjoy reading Elektor magazine in digital format for only £3.75 per month (approx. € 4.50). You save 25% on the regular membership rate! What’s more, the first 50 customers to place an order will also receive an Elektor-brand tablet cover (10 inch max) free of charge! Become a part of the world’s largest (multilingual) community of people with a passion for electronics, amounting to some 300,000 fellow members living in 80 countries. Take out a GREEN membership today!